At the Museum of Aviation Thursday, students from 20 Elementary schools in Houston County displayed products and performances they've created. It's part of the annual Day at the Museum of Gifted and Talented Education, or GTE. Students acted as museum curators and took folks on tours of their creations. It's no secret that Doryan Mizelle is a talented kid. "I want to be a scientist so I can test experimental items out," said Mizelle. On Thursday morning, he got to show off some of those skills, "Our paper roller coaster that took us more than few weeks to make because we are trying to demonstrate how kinetic energy and gravity affect motion," said Mizelle. Jan Jacobson, director of Gifted and Talented Education in Houston County, says the students act as museum curators and take folks on tours. "The marble goes down and straight to the funnel," said Jacobson. Meanwhile on the other side of the Museum, "We are doing the New England Colonies. We're also doing force and motion science and integrating all of that together as one." That's ten-year-old Zaria Glover, her group made food trays representing what colonists ate. "This is our fruit tart tray, and sometimes farmers, they would get all of the goods that they cropped up and make it into something wonderful. As you can see, we have berries and the tarts on the plate, and sometimes they would add in just a little sweet treat in," said Glover. And it may look tasty, but it isn't edible. It's made entirely out of Play-Doh. "And it's, like, just fun to bring some of that stuff together and to present it to people that haven't seen some of that stuff before," said Glover. 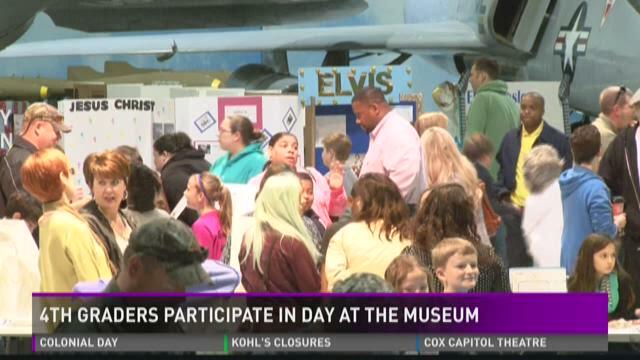 The museum held two sessions on Thursday and more than 600 students were there.